Colorado's Black Forest Fire Is Now 30 Percent Contained : The Two-Way The fire that is being called the most destructive in the history of Colorado is now 30 percent contained. But 400 houses have been destroyed in the blaze. 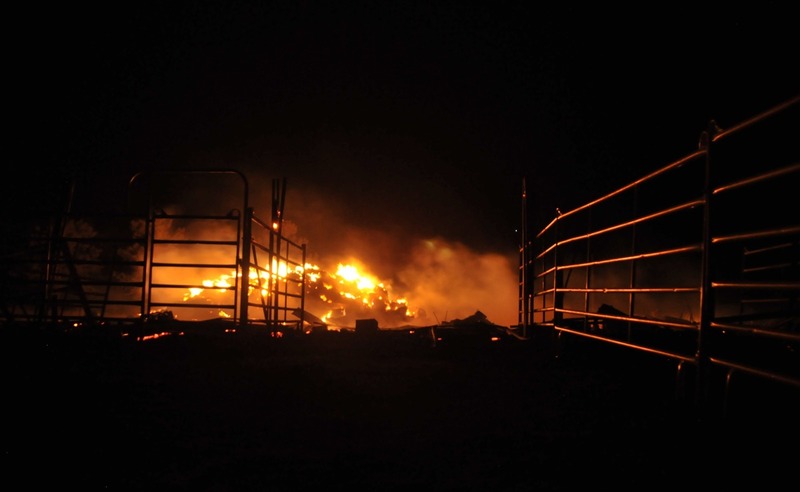 A fire that's been burning since Tuesday continues to consume acreage near Colorado Springs in Black Forest, Colorado. While firefighters are holding the line, the Black Forest fire northeast of Colorado Springs is being called the most destructive in Colorado history. The fire is now 30 percent contained, officials say. "We had a real good day without wind," says federal incident commander Rich Harvey. "I think the rain had a tremendous impact. So, some things finally turned in our favor." The number of homes destroyed in the blaze now stands at 400. But because of the progress made Friday, requests that neighboring states send National Guard help have been withdrawn. The El Paso County Sheriff's office reports that ten more homes were destroyed in the Black Forest fire, bringing the total to 389. These homes were burned early in the fire but were not discovered until a more complete survey of the burn area. No homes were lost overnight, according to Dave Rose, spokesman for the county. "You're going to see that number go up," Rose tells NPR, as sheriff's deputies are able to access burned out areas that have been "too hot to access." Rose adds that a thunderstorm brought a little bit of rain and cooler temperatures to the area Friday afternoon, giving firefighters a slight boost. The storm also brought lightning strikes that sparked new, but small, blazes nearby. Those were put out quickly he says. Colorado Gov. John Hickenlooper has requested help from National Guard units in Nebraska, Wyoming and Utah, according to spokesman Eric Brown, and each state is sending firefighting helicopters and crews. Lt. Skye Robinson of the Colorado National Guard says Utah is sending two UH60 Blackhawks and Nebraska and Wyoming are sending one Blackhawk each. The copters are expected to arrive today. Their crews will be briefed and equipped, Lt. Robinson says, and then likely deployed on the fire lines tomorrow. Each copter will drop water on the blaze from "bambi buckets," which are smaller buckets with dropout bottoms and electronic triggers. The Air Force and Colorado National Guard are also sending in more resources from bases in Colorado and Wyoming according to the U.S. Northern Command. The help includes 28 bulldozers, fire engines, water trucks and command vehicles. More than 200 military personnel are staffing checkpoints, providing air traffic control, fighting fire on the ground and working as crews in helicopters, airplanes, engines and other vehicles. The nation's wildfire response system depends on local resources first. When they're taxed or exhausted, regional resources are requested. When regional limits are reached the call goes out to the National Interagency Fire Center (NIFC) in Idaho for national crews and equipment. Some national resources are already working in Idaho, including a "Type 1" logistics command team, which is sent to the most serious blazes. Sequester-mandated budget cuts have trimmed 500 positions from the federal firefighting force but NIFC spokesman Ken Frederick says, "we're not having any trouble with resources yet. It's early in the fire season," and fire activity elsewhere in the country is relatively light. NIFC's daily "situation report" says 800 people are working at the Black Forest fire as firefighters and support staff. But Frederick says "that's a fluid number. That number has changed," given the deployment of additional crews and equipment today. He said the actual number of people fighting the blaze will be updated tonight. "A Black Forest fire home assessment released at 10:00 p.m. Thursday by El Paso County put the number of homes destroyed since the fire began Tuesday afternoon at 379. Last summer's Waldo Canyon fire — which burned just about a dozen miles southwest of the Black Forest fire — destroyed 347 homes. "The county has stressed on their website 'information concerning intact or partially damaged homes may change.' "
KDVR-TV in Denver spoke to a couple who has been married for 50 years. During the evacuation, they were separated. As Barbara Zink put it, at one point they thought they would never see each other again. Luckily, this story has a happy ending. Barbara and Warren Zink were reunited after about a day. "I'm not ready to give him up," Barbara told KDVR. "I want 50 more years to torture him." CBS News reports the fire is 5 percent contained. The cause of the blaze is still under investigation and "more than 750 firefighters were fighting the massive wildfire along with air tankers dropping slurry and Chinook helicopters making water drops." — NPR's "Fire Forecast" app, which is updated daily. We'll embed it below. The interactive should take you right to Colorado Springs, but you can change the location by entering a new "ZIP code, city, etc."